1. Target balances are the necessary consequence of an asymmetric crisis in a monetary union - when there was no crisis there were no significant Target balances, if there was no monetary union there would not be Target balances. 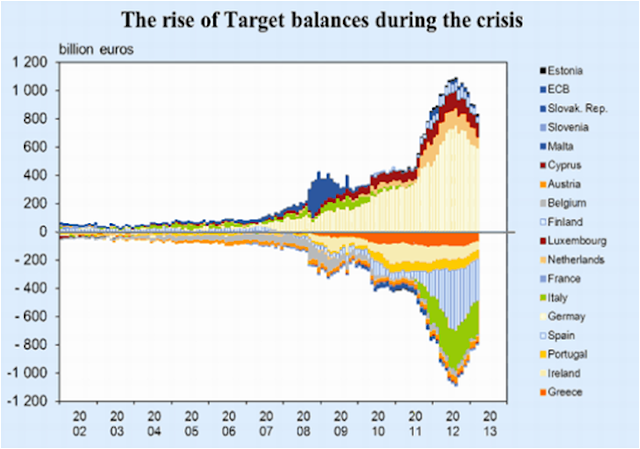 --- _--- (2012) ‘TARGET2 and the European sovereign debt crisis, Kredit und Kapital, 45 (2), 135–174. "4. If a limit, explicit or implicit, was established on Target balances and thus market participants would no longer be assured that, at any point in time, the Eurosystem would make good the liabilities of all its members, inevitably runs on central banks would follow, threatening the existence of the euro."